Congress keeps breaking the Beltway Book of World Records for spending money, but the government will soon report that the federal budget deficit for the just-completed 2006 fiscal year fell to about $260 billion. What's the secret of this deficit success that you aren't reading much about this election year? It isn't spending restraint. The federal budget expanded to $2.7 trillion last year, a 9% increase, or three times the inflation rate. 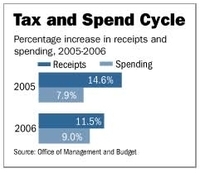 Over the past six years the federal budget has increased by 49.2%. The main cause of the deficit decline -- 90% of it, says White House budget director Rob Portman -- is a tidal wave of tax revenue. Tax collections have increased by $521 billion in the last two fiscal years, the largest two-year revenue increase -- even after adjusting for inflation -- in American history. So, what made the difference? Where did the increased tax revenue come from this year? The discussions I saw re the prior fiscal year's increased revenues suggested that the revenue increase would be a one-off, due to tax aspects extant for that one year only.